I was first introduced to the idea of Flavor Families in 2008, when I attended a workshop in Santa Fe, called Refreshing the Shape of America’s Plate. Amanda Archibald, of Field to Plate, explained the nuances of food flavors and textures to us. I was intrigued by what I learned from her, as well as what I learned from Rocky Durham at the Santa Fe School of Cooking about balancing flavors while cooking. We did experiments with ingredients where you throw off the flavor of a recipe by adding too much of something, and then “fixing” it by adding something else. I’ve often used the knowledge I gained there for adult clients, and a couple times for kids. This time, for E, I had a bigger challenge because it wasn’t just general dietary-expanding I was trying to achieve. I was trying to get a 3 year-old who would only eat crunchy, salty, and/or white foods to eat things that looked, smelled, and tasted much different than what he was used to. 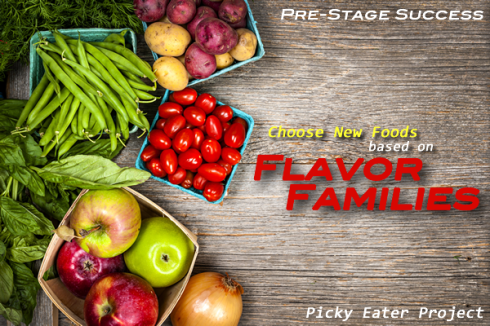 Here’s the deal with Flavor Families. You can set yourself up for early and more success if you take note of what your picky eater does like, and then introduce something new but similar. It sounds like common sense, but it’s not as easy as it sounds when you’re dealing with an irrational child. Plus, it’s really tempting to just choose foods that you think should be yummy to a child. I had tried that many times in the past and it didn’t work. So when I started the Picky Eater Project, I wanted to make sure I was being more selective and choosing with a real method. For example, I know that E likes cucumbers. Cucumbers fall into the Grassy family. Other things in this family include: celery, (too stringy and hard to eat), asparagus (no way would he even try it, just based on looks), chard, fennel, frisee (nope, nope, and nope), parsley, spinach, romaine (all NO), green beans, and snow peas. I thought there was a chance he’d try green beans or snow peas. I found green beans first so that’s what I went with. I washed them and snipped off the ends of the three most perfect unblemished beans in the bag before serving them to E.
I told him that we had run out of cucumbers, but that we were so lucky because we had some of cuke’s cousins. He gave me a skeptical glance, but looked kind of interested too. I handed him a plate with three green beans on it. I made sure this happened at a time I knew he was hungry. He looked at me, but pushed the plate back a little bit. He said yes and picked one up and licked it. I took an exaggerated bite of a green bean (not from his plate) to demonstrate crunch since I know crunchy foods are appealing to him. I said, “Green beans are vegetables. They’re yummy and good for your body.” Then we dropped it. Sometimes now, when I serve him green beans, he protests, but he usually eats them. I’ve used the Flavor Families method several times since then. It doesn’t always work because some foods just aren’t appealing to him yet (like chard… it’s just not really a 3 year-old type of food), or because he doesn’t like the texture or color. With an older child or with an adult, you can actually list families out for them on paper and ask them to circle the foods they like. Once that is done, you can ask some questions about texture preferences and come up with some suggestions for them to try. It seems really simple and obvious, but I’m generally amazed at how well it works when I pay attention to the flavor families!